Roll pastry into a 12-inch circle on lightly floured surface. Fit into 9-inch pie plate. Fold edge under and flute edge. Combine corn syrup, eggs, pecans, butter and vanilla in a medium bowl. 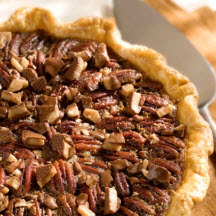 Toss 2/3 cup of the toffee pieces with flour and stir into pecan mixture. Pour entire mixture into pie pastry. Bake for 40 to 45 minutes, or until knife inserted in the center comes out clean. Remove pie from the oven and place on a cooling rack. Immediately sprinkle remaining 1/3 cup of the toffee pieces over the top. Nutritional Information Per Serving (1/8 of recipe): Calories 690; Fat 40g; Cholesterol 110; Protein 7g; Saturated Fat 13g; Trans Fat 0g; Sodium 490mg; Carbohydrates 84g; Sugar 58g; Iron 6%;Fiber 8%; Calcium 4%.